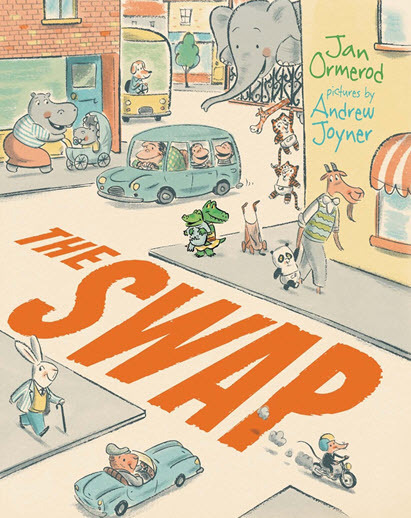 At which point, break out the latest book by Jan Ormerod and illustrated by Andrew Joyner – The Swap. Caroline’s mother thinks her new baby is gorgeous, but Caroline doesn’t agree at all. In fact, Caroline thinks her new brother is smelly, no fun, and worst of all, he dribbles. 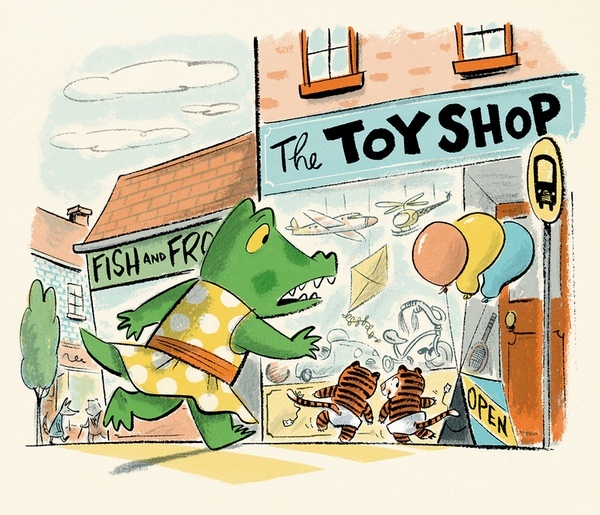 Actually, Caroline is very, very jealous and so she does what any sensible crocodile would do – takes her brother back to the baby shop and asks to swap him. The helpful assistant at the baby shop gives Caroline all sorts of other baby animals but each has their own foibles and none are quite right. The story has the same enticing elements as classics such as Dear Zoo, where the choices on offer seem like a good idea but the reality is anything but. 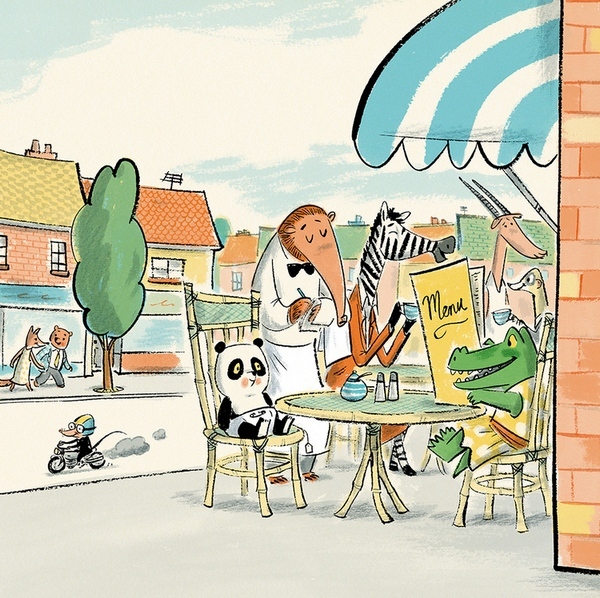 Caroline’s choice of baby panda is fantastic until the cub eats the bamboo furniture – Caroline returns him to the baby shop explaining to the assistant that he is no good because he’s a “fussy eater”. Similarly, the elephant is too big and ‘squirty’ and the tiger cubs are too rambunctious. Joyner’s illustrations are exceptional. 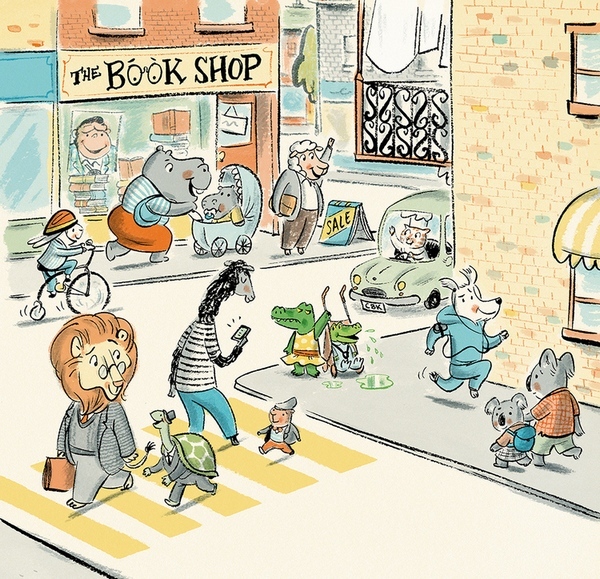 With a Richard-Scarry-Busy-Town-vibe and a restricted colour palette of pastel blues, greens, oranges and yellows, your eye is drawn to Caroline and her baby brother on each page. Like Joyner’s previous efforts (most recently we reviewed Too Many Elephants in This House), he manages to put an incredible amount of expression into his characters’ faces. Caroline staring sulkily over her dinner; her exasperation at having to stand with her dribbling baby brother on the busy street; and her fed-up expression as the replacement siblings wreak havoc are all priceless. Sadly, Ormerod died earlier this year, and this book is dedicated to her. Ormerod was the author and illustrator of many wonderful books including Maudie and Bear and 101 Things to Do with Baby. The Swap is the perfect book for any child who may be struggling to welcome a new addition to the family and is also ideal for exploring broader themes of jealousy. Find The Swap online at Fishpond (and go all out on the hardback edition – the embossed cover and the orange cloth binding is beautiful).